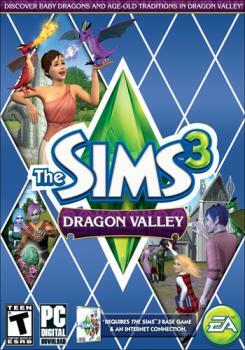 The Sims 3 Dragon Valley is an exciting expansion to your favourite world of sims. The game is set in "Dragon Valley", a land of myth and fantasy, where players control the elven Sims and nurture their pet dragons. The elves work to ensure that their military is strong, their people are ready to handle calamity, and that the scientific methods they’ve used to keep the dragonlings small stay intact. The town is peaceful for now, but a conflict is brewing between the Mithrilen and O’Connell families for control of the town. It’s tradition vs. progress; on which side will you stand? This expansion definitely provides a different universe or dimension that many people would love to experience. With Sims, it’s always about the experience. Whether it’s who you interact with, how you spend your money, what career path you choose, or even just building/growing your lifestyle, Dragon Valley adds to this. People now get to experience a world of fantasy. I can imagine people who loved D&D, Dragonlance, and especially Lord of the Rings getting into this. It is definitely a great experience. For me, The Sims 3 is the best simulation game ever. It's great for people who want to disconnect in a virtual world, where they can live governed by their own rules, have the long dreamed home, the perfect job, the greatest garden. Now, with this expansion pack installed, the world of sims has changed, dragons and elves bring a medieval air, fantasy leads the life of our sims. And, of course, there are plenty of new items, furniture, clothes and many other for the addicted players to enjoy. The Sims 3 is awesome and I just loved all the expansions! OK, this update to the franchise is just perfect for anyone into Dungeons and Dragons or who likes watching Game of Thrones. Maxis have created just the right atmosphere for die-hard SIMS fans who want some dragon fantasy in their life. Enjoyed every minute of this one!